Third book in the Raven Cycle, after The Raven Boys and The Dream Thieves. I cannot review this one in regular fashion. I just love these books too much to formulate coherent thoughts. Instead, I will simply list out some of my random thoughts along the way. Page numbers here refer to the library hardback version that I read. And yes, I will definitely acquire my own copies of all these books in the very near future. – Page 36 – I don’t believe I’ve ever read a scene of this much young, bittersweet longing. Amazing. I won’t admit how many times I reread it over the course of a few days. – This book makes me want to learn Latin, something I’ve never wanted before. – Page 76 – Whoa. Unpleasant chills running up and down my skin. Really, really creepy. – Page 131 – Aw, Ronan, that was sweet. – Oh man, turns out the murder squash song is fictional only. Boo. Fruitless google searching yields fruitlessness. – Page 191 – I feel very, very strongly about these words about ties to a family home. Go, Ronan! – Chapter 27/28 – Whoa. WTF-moments galore. And some interesting insight to Stiefvater’s sketches that have been showing up on Facebook. Maybe. I’m guessing. – Page 298 – YES! Adam, yes yes yes! Thank you!!! Finally! – Page 342 – NO!!!!! – Hm. Not what I expected from Colin Greenmantle. Interesting. – Well, maybe not the worst cliffhanger. Not completely. But still. How long do I have to wait for the next book?? – Also: I wish this series was twenty books long instead of four. Because Blue. And Gansey. And Adam Ronan Noah Mr. Gray Maura Calla Persephone…I am so in love with all of them, even more so now. Character development = perfection. – Also: Absolutely perfect way to end the RIP season. – Also: As soon as I finished reading the book, I read it a second time. Now that that’s done, it’s time to reread the series from the beginning, again, and then again, and maybe another again. Yes, I know. It might be overkill, but that’s just the way I approach these kinds of books. Multi-reads. Gotta binge-read until my brain is saturated with them. I did the same thing with the Hunger Games series, and Harry Potter, and Howl’s Moving Castle, and the Mistborn trilogy, and…yeah. The list could go on. And yes, I love love love when I find the rare book/series that makes me multi-read. They are the best! 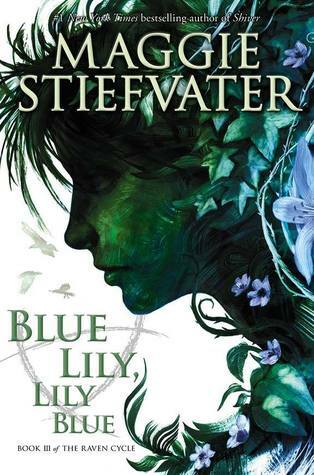 Revisited on audio December 2014: Will Patton reads the audiobook of Blue Lily, Lily Blue, just as the last two books. I did not enjoy this performance as much, mostly because of his interpretation of Gwenllian. Granted, she does a lot of singing and mad cackling in the book, so I imagine I wouldn’t have liked any performance of her part. I don’t really blame Patton for that. The rest of the audio performance was fantastic as usual. This entry was posted in 2014, 2015, 2017, Prose, Young Adult and tagged audio, favorite, humor, memorable, multi-read, place-character, reread, RIP-worthy, speculative, WTF moments. Bookmark the permalink. I am so glad you changed your mind on these books. I just finished this one yesterday. So good. What a great series! Ha! I found your review in my own search for the murder squash song. I was so hoping it was real! SPAGHETTIOS! Jesse pretty much stole all of his scenes, even when he was just talking about dinner. Also, good to know I’m not the only one who googled the squash song. I love love love that every one of his words was in all caps. I can’t wait to get the audiobook and see how Will Patton performs it.